The Fifth Gospel is by Ian Caldwell and is due to be published in March 2015. In 2004, as Pope John Paul II's reign enters its twilight, a mysterious exhibit is under construction at the Vatican Museums. A week before it is scheduled to open, its curator is murdered. The same night, a violent break-in rocks the home of the curator's research partner, Father Alex Andreou, a Greek Catholic priest who lives inside the Vatican with his five-year-old son. When the papal police fail to identify a suspect in either crime, Father Alex, desperate to keep his family safe, undertakes his own investigation. To find the killer he must reconstruct the dead curator's secret: what the four Christian gospels - and a little-known, true-to-life fifth gospel known as the Diatessaron - reveal about the Church's most controversial holy relic. But just as he begins to understand the truth about his friend's death, and its consequences for the future of the world's two largest Christian Churches, Father Alex finds himself hunted down by someone with vested stakes in the exhibit - someone he must outwit to survive. Famous bestselling author, loving husband, generous friend -- Henry Hayden has it all, or so it seems. What does it matter that his novels are in fact all written by his loving wife? But when Henry's carefully constructed life is threatened, and his attempt to solve the problem leads to the death of his wife, it starts to look as if everything might fall apart. As Henry weaves an increasingly complicated web of lies, half-lies and half-truths in a deception which is as entertaining as it is dark, he remains a compelling character, evading the consequence of every action as he plays off the police, his publisher, his friends and above all his past. The Truth and Other Lies is a dark, clever, and hugely entertaining thriller by Sascha Arango and introduces readers to sociopath Henry Hayden. It is due to be published in June 2015. Germany, there as Medical Officer for the British prisoners. With the Allied blockade of Germany, food is perilously short in the camp and when a new prisoner is murdered all assume the poor chap was killed for his Red Cross parcel. Watson, though, isn't so sure. Something isn't quite what it seems and a creeping feeling of unease tells Watson there is more to this than meets the eye. And when an escape plot is apparently uncovered in his hut and he is sent to solitary confinement, he knows he has touched a nerve. 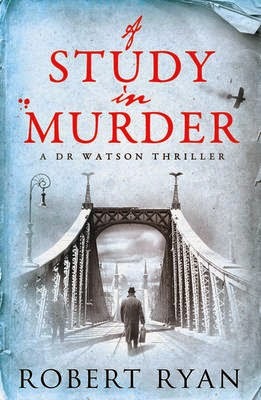 If Watson is to reveal the heinous crimes that have occurred at the camp, he must escape before he is silenced for good. All he needs is some long-distance help from Sherlock Holmes... A Study in Murder is by Robert Ryan and is due to be published in January 2015. Orient, seated at the toe of the north leg of Long Island, ebbs, and flows with the seasons. When the days start to grow, the first SUVs begin to roll in, filled with beach towels, croquet sets, and the summering multitudes of nearby New York City. But when the season reaches its close and the swell recedes, a town remains in its wake. This is the real Orient, the one that stood on its lawn, gardening trowel hung low at its side, eyes squinting against the sun, as Mills Chevern rode into town in Paul Benchley's passenger seat on that last day of summer. Who is this foster kid? Where did he come from? Why did Paul, that nice, lonely, middle-aged neighbour bring him here to our quiet streets? It's not long after Mills rolls in that all hell breaks loose: the local handyman is found bloated to bursting in the bay, an elderly neighbour is discovered face-down in her garage, and a grotesque creature washes up on shore. As the town swarms with fear, Mills (we're certain that's not his real name) finds himself the chief suspect in a riddle of violent deaths, one he must solve before his own time runs out. Orient is by Christopher Bollen and is due to be published in April 2015. In Place of Death is by Craig Robertson and is due to be published in May 2015. A man enters the culverted remains of an ancient Glasgow stream. Deep below the city it is decaying and claustrophobic, and gets more so with every step. As the ceiling lowers to no more than a couple of feet above the ground, he finds his path blocked by another person. But the person is has been murdered. DS Narey leads the investigation to find out who the victim is and who killed him. Photographer Winter begins an investigation of his own, through the shadowy world of urbexers, people who pursue a dangerous and illegal hobby, a world that Winter knows more about than he lets on. Meanwhile, DI Derek Addison is trying to prevent an escalating drugs war, which has already left several casualties in its wake among the city's rival gangs. A new face in town is upsetting the established order. Against a backdrop of hauntingly atmospheric and dangerous buildings, the tangled links between the gangs and the urbexers who have strayed unwittingly into deadly territory draw all three investigations together. Broadstairs, Kent, 1850. Part sea-bathing resort, part fishing village, this is a place where people come to take the air, and where they come to hide...Delphine and her sister Julia have come to the seaside with a secret, one they have been running from for years. The clean air and quiet outlook of Broadstairs appeal to them and they think this is a place they can hide from the darkness for just a little longer. But this is a town with its own secrets, and a dark past. And when the body of a young girl is found washed up on the beach, a mysterious message scrawled on the sand beneath her, the past returns to haunt the town, and they cannot escape what happened here years before...A compelling story of secrets, lies and lost innocence... The Widow’s Confession is by Sophia Tobin and is due to be published in January 2015. A family holiday takes a horrifying turn as one of the party is found dead. At first Emily believes it to be a terrible accident, but soon secrets emerge that throw suspicion on those closest to her … Here We Lie is by Sophie McKenzie and is due to be published in May 2015. I live in Germany and I like to read crime stories. Your blog is a great help for me to find interesting books. "A Study in Murder" by Robert Ryan made it directly to my 2015 book wish list.